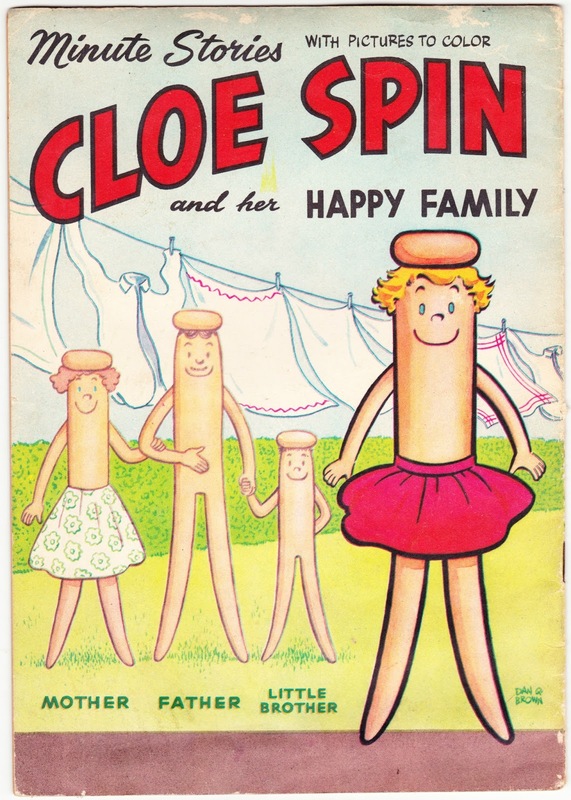 Papergreat: Book cover: "Cloe Spin and her Happy Family"
Preface: This is actually the back cover of this book. The front and back covers are nearly identical and the front cover is in rougher shape, so I'm displaying the back here. Also, more importantly, I apologize for the fact that this family has serious issues with regard to wearing sufficient clothing. Author: None listed. Can't imagine why. Price: None listed. At one point, it was listed for three cents used. Note from publisher: "Minute Stories — With Pictures to Color — have been conceived and carefully edited by us as a development of an idea that parents would welcome a companion project whereby they might enthuse young children in various subjects, which their tender minds would readily absorb — and yet help develop their knowledge of many things about us, which to the adult are commonplace, but which are wonderfully new and exciting to the newcomer." What?? I have no idea. I mean, it's a book about mostly naked clothespin people. That's neither commonplace to adults nor a subject in which tender minds need instruction. Characters featured: Cloe, Father, Mother, Little Brother, Miss Betty Basket. First sentence: Monday is a day we all help. Last sentence: The Clothespin family is a happy one because we all join in our work — and have such fun when we play. Random sentence from middle #1: Little Brother cannot seem to stop eating. Random sentence from middle #2: They carry the lemonade and colored soda water which taste so good at the picnic. Random sentence from middle #3: Little Brother watches the lemonade closely so no dirt gets into it. Random sentence from middle #4: Sometimes a pupil will not pay attention and disturbs the rest of the class, and to punish him Miss Basket makes him sit at the front with a dunce cap on his head. Notes: A copy of this coloring booklet exists within the Joe and Lil Shapiro collection of laundry ephemera (1805-2010) at Brown University's John Hay Library. ... Stephens Publishing is still in business. These days it concentrates on spreading the word about fire safety awareness with promotional items, including coloring books.